Intelligent Automation requires both a top-down and a down-up strategy and the proper content capabilities to drive this strategy. Why is Information Management Modernization So Important Right NOW? The best way to think about HR process automation is by thinking about it over the lifecycle of an employment relationship and the kinds of documents that are typical in each stage of the life cycle. Every day represents a new set of people-process-technology challenges for HR professionals. From the time a prospective employee first comes into contact with an organization to the time they leave or retire, HR professionals must deal with myriad of documents and processes that span the entire lifecycle of an employment relationship. 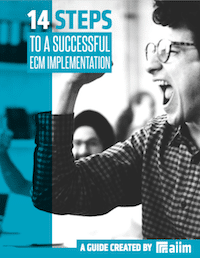 Enterprise Content Management (ECM) is a systematic approach to capture, manage, store, preserve and deliver information related to business processes. So if it is related to business processes, especially to core business processes, it must be considered key for any organization.